Nature's Way Alive! 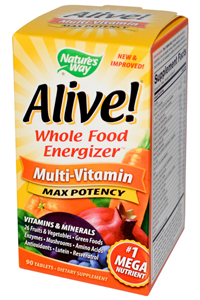 Multi-Vitamin offers whole body nourishment in easy to take tablet form. Take 3 tablets daily, preferably with food. As with any supplement, if you are pregnant, nursing or taking medication, consult your doctor before use. Not formulated for children. Do not exceed recommended use. Vegetable modified cellulose, vegetable cellulose, vegetable stearic acid, vegetable modified cellulose gum, silica, vegetable magnesium stearate, vegetable glycerin. 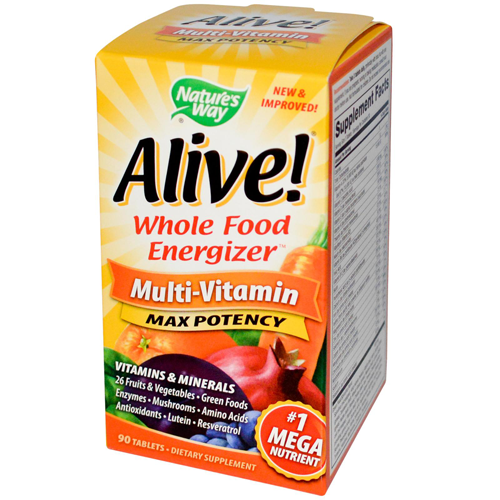 Contains no sugar, yeast, wheat grain, dairy products, artificial flavours, colour or preservatives. Accidental overdose of iron-containing products is a leading cause of fatal poisoning in children under 6. Keep this product out of reach of children. In case of accidental overdose, call a doctor or hospital immediately.